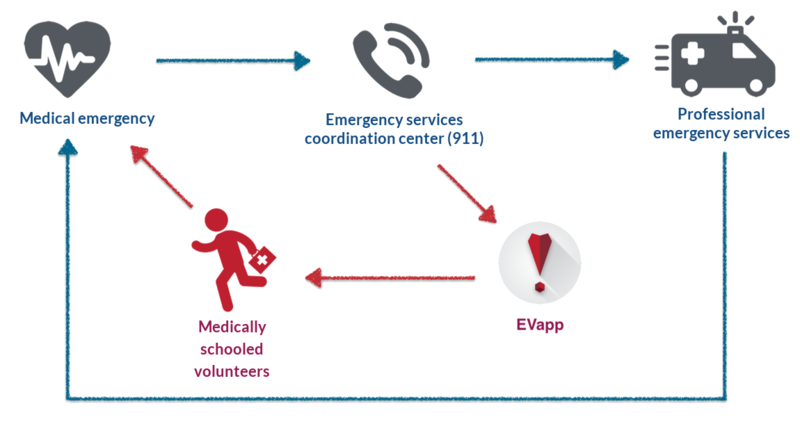 EVapp, which stands for Emergency Volunteer Application, does exactly that. It is a smartphone application that, in case of a cardiac arrest, mobilizes trained medical volunteers to overlap the time between its occurrence and the arrival of the emergency services. If the 112-dispatch center receives a call, they use EVapp to alert volunteers nearby and the application guides the volunteer towards the victim. It also contains the locations of AED’s and will guide the volunteer if one is nearby. By decreasing the time to CPR and increasing the AED usage EVapp can dramatically increase the survival. Don’t have a smartphone? No problem, EVapp can also alert you via text is something happens in your neighborhood. Sign up for our newsletter and stay informed of the latest EVapp news.